If you’re of a certain age then you will remember a day when there were only three TV channels in the UK, then a miracle happened and they introduced a fourth channel. Many years later, a new and exciting (and to begin with slightly dodgy) channel 5 was beamed into our homes. Now there are hundreds of TV channels, and more decent TV programmes than I can keep up with. But back then, when choice was limited, there were only a handful of shows I actually enjoyed. But I watched all sorts because there was literally nothing else on. Of course I did other things, play, read, see friends, whatever, but when I wanted to watch TV, there wasn’t much on. 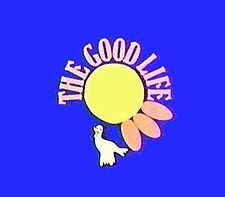 One of the TV shows was called The Good Life. It featured the late, great, Richard Briers, who a more modern audience may recognise as that old mad bloke from Monarch of the Glen, or very recently, the granddad with a zimmer frame spying on women with his binoculars in Cockneys versus Zombies. Anyway, for those who have no idea and never saw it, here’s a link to the Wiki page for the show. Very simply put, Tom and Barbara give up the rat race to become totally self sufficient, growing their own food, raising animals, making their own clothes and so on. It was silly fun and their neighbours, the posh Jerry and Margo, were often horrified by their green fingered grubby antics. I rather enjoyed the comedy and the laughs were genuine, but I never really took much away from it. Or so I thought. Roll on twenty years or so and although I’m not Tom, I’ve started to find that I’m inching my way towards his point of view. I like the idea of being self sufficient, living green, looking after the environment and the planet. I don’t make my own clothes, or generate my own power with methane from my farm animals, but I’m more willing now to explore new ideas around housing, generating power, growing food and trying to reuse stuff rather than keep making more and more. Recycling is pretty much par for the course now, whether it’s water, glass, paper, plastic, all sorts of stuff. Some people don’t bother, but every week I see local recycling centres are busy. We still get the occasional rag and bone out coming around for scrap metal, but most people do it themselves now. Also most places have several bins now, whereas when I was young, you dumped everything in one and the bin man took it away and someone else sorted it out. Landfills still exist of course, but lots of work is being done to do more with what we all throw away. Recently I’ve also started to dabble in growing some of my own veg, although at this stage it is only a hobby. I definitely don’t have a green thumb, maybe a green finger nail at best. Even so, I’m finding there is something immensely satisfying about planting seeds or tiny plants, and seeing them grow and flourish into edible produce. Over the last ten years or so I’ve also started trying to buy more local produce, support local businesses over the big names and therefore support the local economy. The old Tom Peters business adage was always ‘think global act local’. More and more people are now aware of the global landscape (due to the 24 media news cycle and social media), but they are more becoming interested again in local issues, local businesses, local events and dare I say it (or perhaps I’m just wishing it) a slow return to a local community mentality. The other thing is, the whole planet is becoming a bit more like Tom from the Good Life. Fossil fuels are no longer seen as a long-term sustainable way of generating power and there are thousands of wind turbines dotting the landscape. Bio-fuels and other techniques are being explored. Electric cars are no longer a radical idea and saying ‘you should be lowering your carbon footprint mate’ in public will not get you a dirty or quizzical look. Water conservation and also water storage is becoming more important in many western countries, particularly in places like the US and very hot countries like Australia. Supermarkets are sourcing more products locally, dairy and free range eggs and better treatment of animals is now something people expect. Paper is coming from renewable sources, fair trade tea, coffee and other products are common in supermarkets and no longer a rarity. My grandparents are of the generation where you could only buy certain produce at certain times of the year, and they never ate or saw certain fruit until they were much older, as it wasn’t imported in the large quantities that we have today. Where I’m going with this? I’m not completely sure, other than to say the Good Life ran on TV from 1975 to 1978, and since then it has been repeated many times over the years. The thing I wonder about is, why has it taken us so long to get to this place? And why are some people still totally unwilling to believe that we’re having an impact on the environment, climate change and the planet? Some of them are the same people who don’t believe we landed on the Moon, so I don’t pay much attention to them. How we respond to change, big and small, is something I think about. How we’re quick to embrace some things, and yet it takes us decades before something else becomes part of our everyday landscape. How we are constantly looking to the future and yet we seem slow to learn some of the lessons of the past. Why it often seems to take something really shocking to happen before people look a little more closely at the environment, or how international business drills for oil in their back yard. I don’t know what the answer is, I don’t think there is one definitive answer, but for me it means taking stock every now and then, looking at how I live my life and making changes.